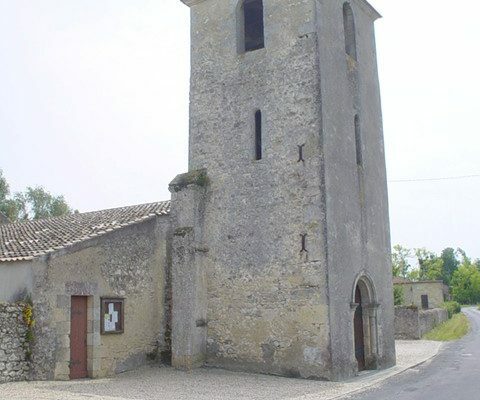 Located just a short distance from the city of Blaye, in the middle of vines, the small village of Saint-Genès-de-Blaye has 500 inhabitants and a lovely Romanesque church. Nineteenth century stained glass windows in the 13th century nave illuminate the chancel with a lovely golden light. One of these windows portrays Saint-Genes d’Arles, the town’s patron saint, with a pen in his hand. 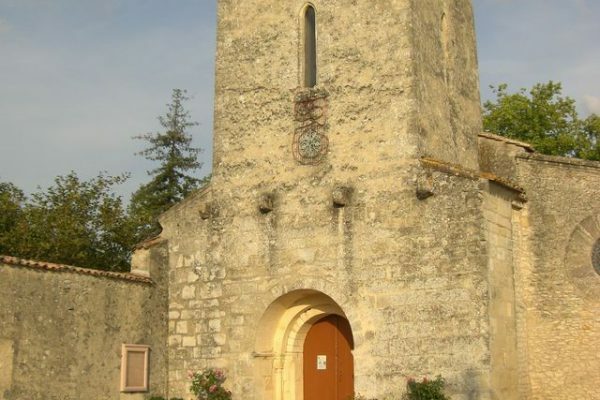 Built on the ruins of a Gallo-Roman villa, the church has pride of place on a sunny square, surrounded by rose bushes of all different colours. Stone benches let tired walkers take advantage of the calm setting before starting off again. A crucifix carved from a vine in the chancel is placed above an altar made from an oak wine barrel. The vaulted bare stone walls and low ceiling give a reassuring rustic feel to the church where the town’s three hundred souls come to worship. 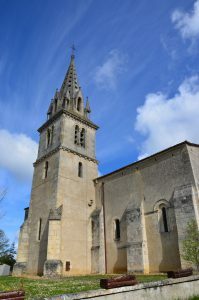 The church in Cartelègue – located “four leagues of Gaul” (i.e. 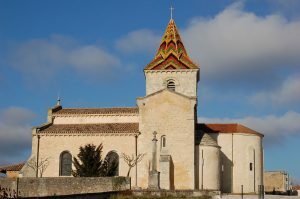 “QUATRA LEUCA“, or approximately 9 km) from Blaye – is really Romanesque in name only. Partially destroyed, then rebuilt, and considerably altered over the centuries, the church is a blend of different architectural styles. If you look closely, you can see Romanesque parts combined with more recent ones. Features include a former hidden door and two stone corbels. The church’s interior decoration is not noteworthy, but has a few surprises in store. The most perspicacious visitors will notice four black stars on the church’s vault of heaven. These can be interpreted to symbolise the 4 evangelists, or possibly the shooting stars one sees in summer that are referred to as “the tears of Saint Lawrence”. What a surprise it is to arrive in Cars! After going past flat vineyards as far as the eye can see, one is suddenly atop a hill overlooking the entire countryside. The view is superb. The vine leaves have turned red and gold in autumn and there is a backdrop of luxurious green… Featuring a roof with orange, red, and yellow tiles, the church is quite attractive as well. Huge and luminous, this old building nevertheless has a very modern interior. The stained glass windows are geometrical and abstract. The inner door leading to the interior is made of glass and you can see speakers hidden behind the columns. Cars can be proud of this monument, which is well-integrated into the village.